Senninger has improved on the i-Wob UP3’s design with the next generation i-Wob2. Featuring a protective shroud that doubles as a nozzle carrier, the new i-Wob2 is capable of better withstanding poor water quality and harsh operating conditions that can cause premature wear on components. 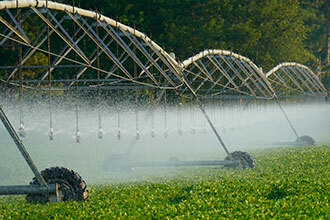 With the i-Wob2, growers will not need to invest in sprinkler package replacement as often. The i-Wob2 features a protective shroud that guards the sprinkler’s wear surface against the splashing of adjacent sprinklers, grit, and the effects of direct UV. Plus, the wear surface itself has been improved to enhance the sprinkler’s longevity. Senninger is so confident in the i-Wob2’s longevity, it’s backed by an unprecedented 3-year warranty on materials, workmanship, and performance. The i-Wob2’s shroud isn’t just for protection. It also doubles as a nozzle carrier that holds two additional UP3 nozzles. Growers who experience frequent drops in well capacity, who need an extra nozzle to irrigate winter crops, or those who just prefer to tailor-manage their resources will now find it easier to change their flow as needed. Renozzling during the season is now a tool-free experience and does not require carrying parts into the field. Just pinch and pull to remove a nozzle from the carrier or the sprinkler and switch it with another. 4 Models. 4 Different Applications. Black Deflector – Ideal for most soil types and applications with its medium-sized droplets and standard angle trajectory. Blue Deflector – Ideal for most soil types and crops but recommended for windy conditions thanks to its low angle trajectory. Grey Deflector – Ideal for tighter soils, small-seeded crops, and germination due to its smaller droplet size and standard angle trajectory. White Deflector – Ideal for very windy conditions and harsher weather thanks to its larger droplet size and low angle trajectory. The i-Wob2 keeps the same core features that made the original i-Wob the most imitated pivot sprinkler in the market. It’s consistently sized droplets maintain their integrity in windy conditions and minimize evaporation loss while its low minimum operating pressure of just 10 psi (0.69 bar) offer irrigators a tremendous opportunity to lower total pumping costs. The i-Wob2 is the newest member of the Wobbler sprinkler line, which Senninger introduced in 1978. Wobbler sprinklers utilize grooved deflectors to divide a flow into numerous streams of water. Their off-center rotary motion further divides each stream into consistently sized droplets. This consistent droplet size is what helps maintain the sprinklers’ pattern integrity against wind-drift and evaporation. Senninger is a leading designer and manufacturer of quality irrigation solutions for agricultural, horticultural, and industrial applications. Their products are designed to use as little water and energy as possible to help irrigators make the most of every drop. With over 50 years of experience in more than 50 countries worldwide, Senninger is one of the most trusted names in the irrigation industry. Originally published as i-Wob2: The Most Imitated Sprinkler in the Market Just Got Better in make it grow (2018, July).